Radiant energy that exhibits wavelength-like behavior and travels through space at the speed of light in a vacuum. 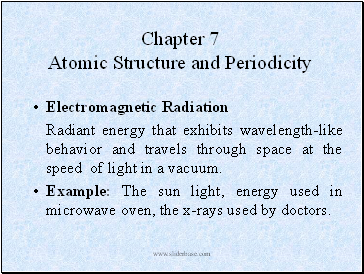 Example: The sun light, energy used in microwave oven, the x-rays used by doctors. 1. 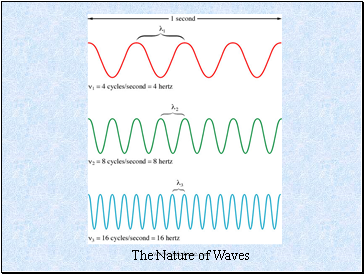 Wavelength (): distance between two consecutive peaks in a wave. 2. 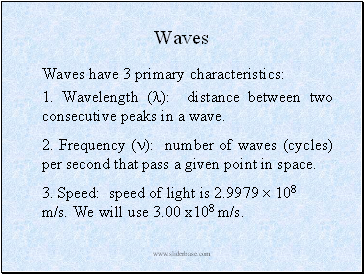 Frequency (): number of waves (cycles) per second that pass a given point in space. 3. Speed: speed of light is 2.9979  108 m/s. We will use 3.00 x108 m/s. 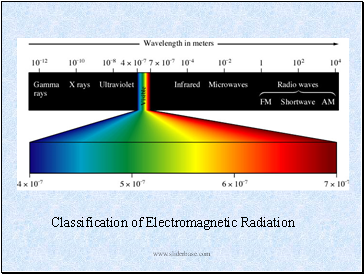 Wavelength is also given in nm (1 nm = 10-9 m) and Angstroms (Å) (1 Å = 10-10 m). 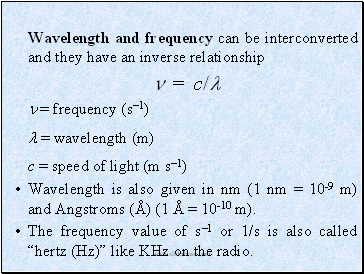 The frequency value of s1 or 1/s is also called “hertz (Hz)” like KHz on the radio. 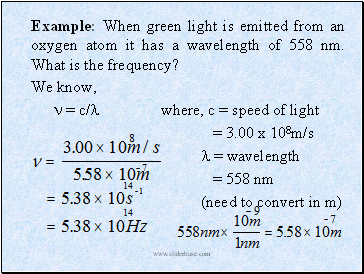 Example: When green light is emitted from an oxygen atom it has a wavelength of 558 nm. What is the frequency? 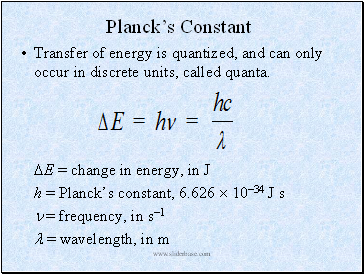 Transfer of energy is quantized, and can only occur in discrete units, called quanta. 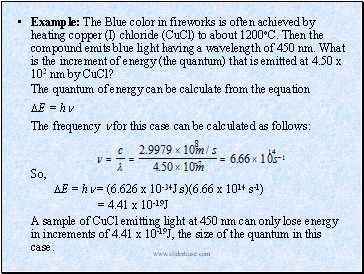 Example: The Blue color in fireworks is often achieved by heating copper (I) chloride (CuCl) to about 1200oC. Then the compound emits blue light having a wavelength of 450 nm. What is the increment of energy (the quantum) that is emitted at 4.50 x 102 nm by CuCl?